I obviously choose to do it. I wrote this paper for my English class. I remember him sitting there on his recliner chair late at night watching television with the volume as loud as it possible could go. Maybe it was to drown out the sound of us four children. The constant call for my mother to get him a drink or to get him some food would make us all turn our heads. He was a quiet man, but when he spoke, we all listened. There was no question of when he was mad; you ran the other way as fast as you could. He never did engage much in my childhood. I remember thinking how odd it was that he was going to school to become a teacher when he hardly ever focused on my studies. It seemed the television held a much greater interest to him. Maybe he was just tired after all; he was going to school, holding a full time job sometimes two, to keep our family running. Maybe his lack of engagement into my life was just that, he was trying to make sure I had what I needed to stay engaged. The perception I had of my father, as I grew up changed, but after his passing in May 2010, I knew my father more than I ever had. After my father received his degree in education, he seemed to be gone more than ever before. I often wondered why he sat at school all night. Could a teacher possibly have that much work to do? I thought it seemed strange, and at times, wondered if it was just an excuse to not come home to his family. There was no doubt in my mind that my father cared and loved us; I just often wondered if he knew how to show it. I had now grown older and my high school was far behind me. My father, who seemed to be at his work far more than his home, let me drop out of high school. I never understood how a man, who said he cared so much about education, let his own daughter drop out of school. My reasoning for dropping out of high school far exceeded just the lazy teen who did not want to go to school. I was not into drugs, I did not drink, and I was not pregnant. I had issues far beyond that and my issues were emotional having lost a close friend pass away tragically. Maybe I misjudged my father, maybe, just maybe he knew exactly what he was doing. Maybe he knew me better then I knew myself back then. Maybe he knew it would work out if he let me get out of the one struggle I had in my life. As I grew older, got married, and had a family of my own, my father remained teaching at the same school. Not much changed either; he still stayed at the school all hours of the night. My mom still got his dinner when he got home, and he still watched television on his recliner as loud as it could be. He never change really with one exception, he was an amazing grandfather. I think my father went to more of my children’s school functions then mine. I think he interacted more with them then he ever did as I was a child and you could see the love in his eyes. It was my Dad’s long eight month battle with esophageal cancer when I learned more about him then I ever knew. As I watched my, now frail Dad sit in his bed, whether he was at the hospital or at home, he was surrounded by little notes given to him by his students and co-workers. It was his fight to get back to school and be with his students that made him gain strength. It was his track team that got him through the last few months and getting to see the trophy his debate team won just a day prior to his passing. With each day, week, and month that passed he had one remaining goal in mind, to see his students, to be with his class, and to be doing what he loved most, teaching. I remember getting mad at my father for wanting to work while he was so frail and sick. I told him he needed to stop, gain his strength and get better, and that his students were just fine without him. He disagreed with me and went back to school every chance he got. It was my father’s last day here on earth when I started to understand the big picture. It was when all his colleagues old and new came pouring in to say good-by to my Dad. It was the school janitors that came to say how much they loved him, and how he helped them by just his kindness. It was when two old students came to see him, and one of them became a teacher and was substituting for my father while he was ill. It was their stories of my Dad, who was this guy I never knew. It was all the kids who gave me hugs, told me stories of my father, and cried when they heard he was gone forever. It was the Mother and daughter who came to his school because she knew I was going to be there; to tell me thanks for having such a great father. That he had helped her daughter through some of the hardest times of her life. It was the story that my Dad would help all the kids that needed help, the kids that struggled, and the kids which no other teacher could reach. It was the story that my Dad secretly bought a boy shoes because his parents could not afford them due to his Dad losing his job. It is the bench that now sits outside the school building where my Dad taught in his memory. Standing on that church pew talking about my Dad at his funeral, I instantly became proud to be his daughter. Looking out and seeing all the young faces of the kids my Dad had touched moved me. My father knew all along he had instilled more in me then I ever knew. He knew I would be fine and make things happen for me. He knew I did not need him at all my school functions or sports events. He knew others needed him more than we did. He knew he needed to help kids that didn’t have a Dad like mine. 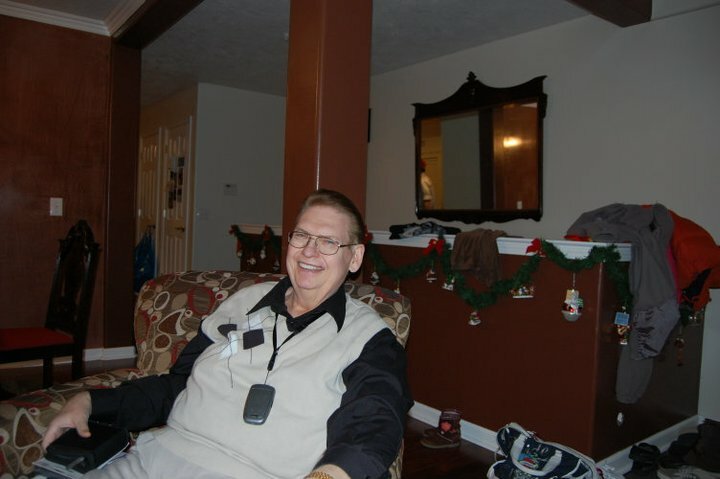 If you would have told me that last year would be the last Christmas with my Dad, I would not have changed a thing. It was a good Christmas.